The National Institute of Allergy and Infectious Diseases’ (NIAID), part of the National Institutes of Health (NIH), released new guidelines today to help prevent the development of peanut allergy. For years, guidelines told us that parents and pediatricians should delay giving peanut-containing foods to children until after age three. However, all of our best evidence now shows that early introduction of peanut-containing foods is associated with less peanut allergy. In 2015, a landmark study called LEAP (Learning Early About Peanut Allergy) provided strong evidence that early introduction of peanuts prevents the development of peanut allergy in many children. LEAP findings showed that the group of at-risk infants who ate 2 grams of peanut three times a week had significantly less allergy to peanuts at 5 years of age compared with infants who avoided peanut. The at-risk babies were all less than 12 months of age with eczema and/or egg allergy. LEAP is important because it was the first study of its kind to show how giving peanuts early to high-risk infants can effectively prevent the development of the allergy. Because of LEAP and a few more studies, an expert panel of doctors, scientists, and public health experts created new guidelines for early introduction of peanut to infants. The guidelines could have far-reaching impacts on the development of new cases of peanut allergy. The new guidelines recommend that before 11 months of age, all infants should start eating age-appropriate peanut-containing foods. The ideal age is closer to six months. For full background information and specific details, please read the guideline document. The information in this blog post is an introduction to new concepts and a general guide. And of course, speak with your child's doctor first. The guidelines for introducing peanuts to infants will depend on their risk of peanut allergy. Work with your doctor to identify your child’s risk beginning around 4 months of age. Parents and health care providers may decide whether to test for sensitization and method of introducing peanuts, given the lack of data in this group. How Much Peanut Do Infants Need to Eat? In the LEAP study, 75% of children were able to eat this amount of peanut through the entire study. What Type of Peanut-Containing Foods Should Parents Give to Infants? Is the baby ready to eat solid foods? This is the first consideration. They should already be eating other solid food before introducing any peanut-containing foods. 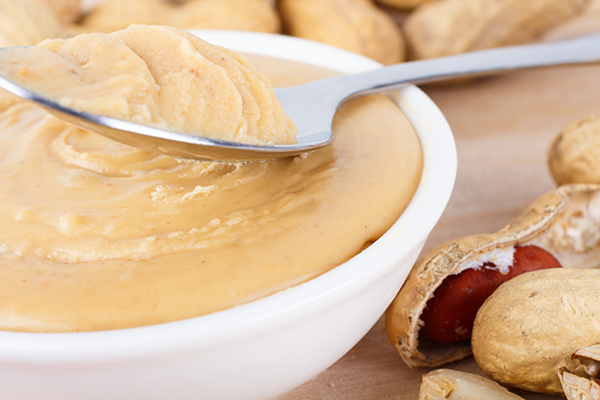 Never give an infant whole peanuts, chunks or undiluted peanut butter. The baby could choke. If symptoms suggesting an IgE-mediated allergic reaction have previously occurred (hives, swelling, anaphylaxis) after ingestion of peanut, then that infant should be evaluated for suspected peanut allergy. This visit should occur quickly. The risk of developing peanut allergy increases with age. 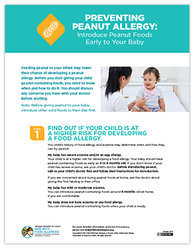 Parents should contact their health care provider for additional evaluation of possible peanut allergy if infants have alarming symptoms after introducing peanuts. These guidelines address prevention of peanut allergy and do not apply to anyone with known or existing peanut allergy. You should not confuse these guidelines with treatment recommendations or any form of immunotherapy. Dr. David R. Stukus is an Associate Professor of Pediatrics in the Section of Allergy/Immunology at Nationwide Children’s Hospital in Columbus, Ohio. In addition to his interest in caring for families with food allergies and other allergic conditions, he also serves as the Director of the Complex Asthma Clinic. He previously completed his residency at Nationwide Children’s Hospital and his fellowship at the Cleveland Clinic. Dr. Stukus is the Chair of the Food Allergy and Anaphylaxis subcommittee of the Medical Scientific Council of the Asthma and Allergy Foundation of America. You can follow him on Twitter @AllergyKidsDoc. Join our community to follow our blog for the latest news on food allergy research and treatments. Our community also provides an opportunity to connect with others who manage food allergies for support.